There is no doubt about it. The view from England's highest mountain is really quite something. Unfortunately the summit is more often under cloud than not and so if you are one of the thousands of folk every year who manage to climb Scafell Pike only to find yourself cruelly robbed of a summit view (been there and bought the T-Shirt ... many times!) then this is for you. It is a video I posted recently showing a slow 360 degree panorama of the view from Scafell Pike summit with all the main surrounding fells and other view points labelled. Of course nothing can replace the majesty of being up there on a clear day but I offer it to you in compensation for your loss, until such time when you muster the courage to try again and your efforts are surely rewarded (but don't count on it!). Best viewed on a big screen. Wandering around upper Eskdale is a humbling experience. 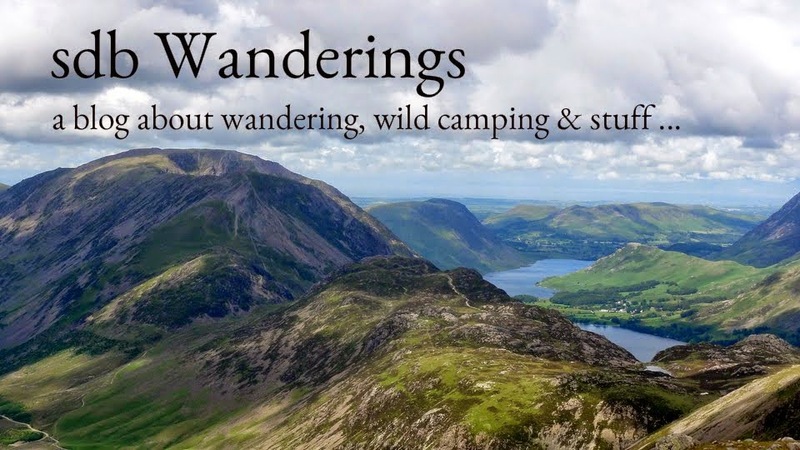 This area, more than any other in the Lake District has a feeling of true wilderness, making you feel small and insignificant amongst the giants of the Cumbrian fells. Adding to the sense of isolation is the fact that this is also one of the least visited areas of Lakeland. I only saw one small group of people from a distance in 4 hours of wandering around the Eskdale valley which was in stark contrast to when finally emerging from little narrowcove onto the main ridge to Scafell Pike summit. Talk about one extreme to the other! From here the route crosses the old Lingcove packhorse bridge before climbing up beside the Esk waterfalls and emerging into upper Eskdale and the vast basin of Great Moss. There are paths to the left and right of Scar Lathing into Great Moss but taking the left path brings you up close and personal to the huge crags of Scafell. Great Moss is a hazardous place as your gaze is constantly drawn upwards to the majestic scenery rather than watching where you are treading! A twisted ankle awaits the unwary as the terrain is a large flat peaty area criss-crossed with many little streams. Getting through with dry feet is a challenge in itself. 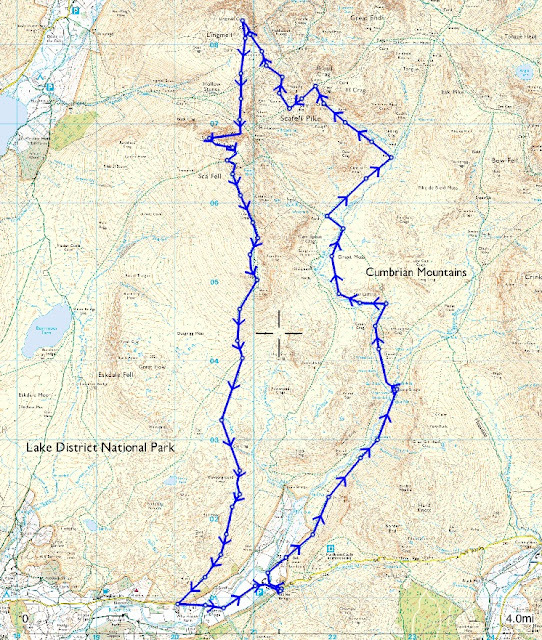 There are route choices to get up onto Scafell PIke from Great Moss. 1) Camspout gully (but I have done that route before to get to Scafell) 2) Up to Esk Hause and then along the main ridge (done that route too but from Bowfell) or 3) via the steep gully of Little Narrowcove (which I haven't been up before). That settled, I headed up the gully which follows the course of a tumbling gill eventually emerging onto the main ridge leading to Scafell Pike summit. This is where I joined the hoards of other folk all wearily plodding the last few hundred feet up onto England's highest ground. So what can I say about Lords Rake. It's steep. It's hard work. It's an exhilarating way up onto Scafell as it traverses its most impressive rock scenery. If you have a spare 5 minutes you can watch this abridged video of me struggling up it. NB. The famous chockstone at the top of the rake finally collapsed on 31st July 2016. May it rest in 'pieces'. It was a comfortable camp until the rain came in the early hours (which wasn't forecast!). While the tarp sheltered me from most of the wind driven stuff I had to seek refuge within the bivvy to keep dry. By morning there no sign of it letting up so I begrudgingly packed up in the rain and trudged back up to the summit before heading down the Slight Side ridge and back to Eskdale. It rained for most of the way. The visibility was about 100 yards. My trail shoes made a surprising variety of different squelching sounds to keep me entertained on the long descent. Below is a 10 minute video highlighting the best bits of the walk, and the process of making camp on Scafell summit. Fluid : Deuter Streamer 2lt Bladder (185g) and 600ml Sigg bottle (100g empty) + Sawyer Squeeze filter (84g). Food : Fuizion Beef Stew, Buttered Bread, Supernoodles,various sugary snacks. Camera : Panasonic DMC-LX7 & lowepro case. Go-Pro Hero 4 Silver and spare batteries. Clothes : Ron Hill wicking T-Shirt, Rab 100 wt fleece (250g), True Mountain Ultralight windproof jacket (100g), TNF Meridian Cargo Shorts (190g), ME beany, TNF E-Tip gloves, sunglasses, Buff, Innov8 short socks. PHD wafer down jacket (about 200g). I wouldn't normally write any sort of gear review after just one nights use but as many people have been asking about the As Tucas quilt I thought I would write a brief 'early opinion' following the first look post a few weeks ago. I camped up on Scafell summit last Thursday night under a tarp and with the quilt in a very roomy MLD superlight bivvy. The temperature was about 6 degrees C and it rained. The trip is described here. So was I warm enough? Yes, absolutely. I wore some very thin base layer leggings, a 100 weight fleece top and a beanie hat. If anything I was a bit too warm and could have left the fleece off. I didn't need to wrap the quilt around me like a cocoon. My feet were toasty. I was in a bivvy bag so I didn't feel any draughts. Without a bivvy may have been a different story. I would have tucked the edges under me in that case. Yes indeed. This was the single biggest difference between the quilt and a mummy bag. I could stretch out a knee or an elbow and turn over with ease. I am a side sleeper and tend to turn over lots. This is not an easy manoeuvre in a mummy bag as the bag turns with me so the hood ends up on top and I end up lying on the zip. In the quilt though I was laid directly on the mat and so could turn over without taking the quilt with me. This made for a notably more comfortable night for me. I did experiment with the 2 press stud fasteners. With both fastened it felt just like a mummy bag but with a bit more room. With just the lower one fastened the quilt was snug around hips but allowed plenty of torso room. My preference was to have both unfastened though. The large MLD bivvy didn't impede movement at all. Well I can confirm that the Shoeller fabric is at least water resistant as rain splash crept in around the neck of the quilt. Also, at some point I fell asleep with my head under the bivvy which resulted in much condensation which also wet the outer quilt fabric. The down stayed dry though and continued to loft well. So far so good then. I want to use it under the trailstar or a tent next, without a bivvy. I can then see how it copes with draughts.